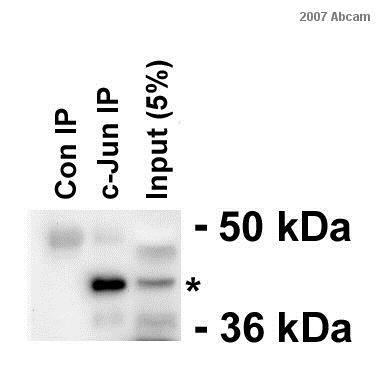 Antibody detects endogenous levels of c-Jun protein around Serine 243. Synthetic peptide within Human c-Jun aa 210-259. The exact sequence is proprietary. ChIP: Human endothelial cells (EA.hy926). IHC-P: Human breast carcinoma tissue. ICC/IF: HepG2 cells. WB: Extracts of HeLa cells. Recombinant Human c-Jun protein. Flow Cytometry: Jurkat cells. Our Abpromise guarantee covers the use of ab31419 in the following tested applications. WB 1/500 - 1/1000. Predicted molecular weight: 36 kDa. Contains 1 bZIP (basic-leucine zipper) domain. Ubiquitinated by the SCF(FBXW7), leading to its degradation. Ubiquitination takes place following phosphorylation, that promotes interaction with FBXW7. Phosphorylated by CaMK4 and PRKDC; phosphorylation enhances the transcriptional activity. Phosphorylated by HIPK3. Phosphorylated by DYRK2 at Ser-243; this primes the protein for subsequent phosphorylation by GSK3B at Thr-239. Phosphorylated at Thr-239, Ser-243 and Ser-249 by GSK3B; phosphorylation reduces its ability to bind DNA. Phosphorylated by PAK2 at Thr-2, Thr-8, Thr-89, Thr-93 and Thr-286 thereby promoting JUN-mediated cell proliferation and transformation. Phosphorylated by PLK3 following hypoxia or UV irradiation, leading to increase DNA-binding activity. Acetylated at Lys-271 by EP300. ChIP - Anti-c-Jun antibody - ChIP Grade (ab31419)This image is courtesy of an anonymous abreview. ChIP analysis using ab31419 binding c-Jun in human endothelial cells (EA.hy926). 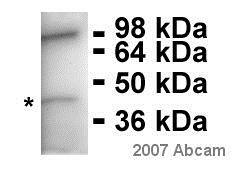 Cells were cross-linked for 10 minutes with formaldehyde then incubated with undiluted primary antibody for 10 hours at 4°C in 1x ChIP buffer. Protein binding was detected using real-time PCR. Positive control: Position 89340150-89340297 in chromosome 11 (has a validated c-Jun site). 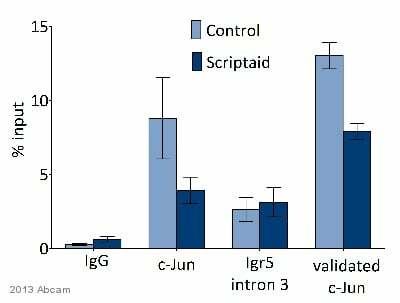 Negative Control: Igr5 intron 3 (contains no c-Jun binding site). Paraffin-embedded human breast carcinoma tissue stained for c-Jun with ab31419 at a 1/50 dilution in immunohistochemical analysis. Right panel: Pre-incubated with synthesized peptide. ICC/IF image of HepG2 (Human liver hepatocellular carcinoma cell line) cells labeling c-Jun (green) with ab31419 at 1 µg/ml. The cells were fixed in 4% PFA (10 minutes) and then incubated in 1% BSA / 10% normal goat serum / 0.3M glycine in 0.1% PBS-Tween for 1 hour to permeabilize the cells and block non-specific protein-protein interactions. The cells were then incubated with ab31419 at 1 µg/ml overnight at +4 °C. The secondary antibody (green) was Alexa Fluor® 488 goat anti-rabbit IgG (H+L) ab150077 used at a 1/1000 dilution for 1 hour. Alexa Fluor® 594 WGA was used to label plasma membranes (red) at a 1/200 dilution for 1 hour. DAPI was used to stain the cell nuclei (blue) at a concentration of 1.43 µM. c-Jun was immunoprecipitated from HEK-293T (Human epithelial cell line from embryonic kidney transformed with large T antigen) whole cell lysate using ab31419 at a 1/500 dilution. Lane 1: Control IgG IP in HEK-293T whole cell lysate. Lane 2: ab31419 in HEK-293T whole cell lysate. Lane 3: c-Jun in HEK-293T whole cell lysate 500 µg (Input). 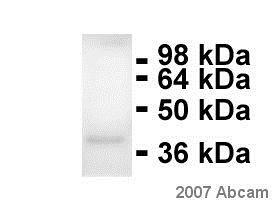 For western blotting an HRP-conjugated swine anti-rabbit polyclonal was used as the secondary antibody. 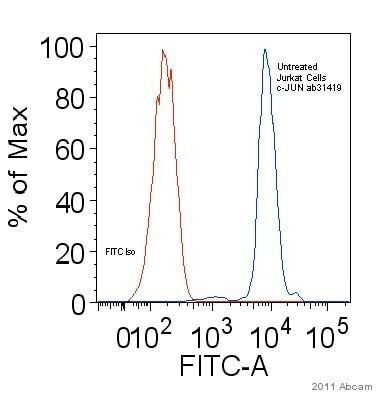 Flow Cytometry - Anti-c-Jun antibody - ChIP Grade (ab31419)This image is courtesy of an anonymous abreview. Overlay histogram showing Jurkat (Human T cell leukemia cell line from peripheral blood) cells stained with ab31419 (blue line) at a 1/300 dilution. The cells were prepared as follows: Spin down, wash in FACS buffer 1x, fix, wash 2x, and stain with primary antibody overnight. Buffer was 0.1% sodium azide with FBS in phosphate buffered solution. 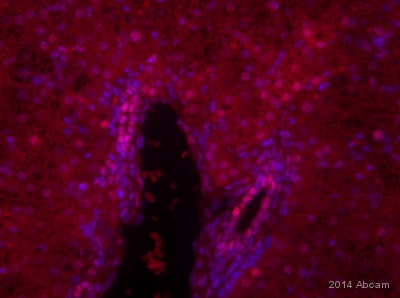 Cells were fixed using paraformaldehyde and permeabilized using Triton X-100 and NP40. Cells were gated by isolating cell population from plot of SSC-A / FSA-A. 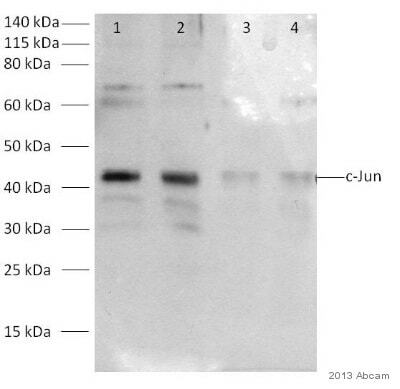 The secondary antibody used was a FITC-conjugated Goat anti-Rabbit polyclonal, diluted 1/100. Publishing research using ab31419? Please let us know so that we can cite the reference in this datasheet. Cell harvesting/tissue preparation method: Spin down, wash in FACS buffer 1x, fix, wash 2x, and stain with primary antibody overnight. Sample buffer: Buffer composition at analysis was 0.1% sodium azide with FBS in phosphate buffered solution.